Asafoetida (Ferula asafoetida, family Apiaceae) is a resin gum which comes from the dried sap from the stem and roots of the wild fennel genus Ferula. Today, the most commonly available form is compounded asafoetida, a fine powder containing asafoetida resin, along with edible starch and gum arabic. Historically Asafoetida has been used to support stomach problems. 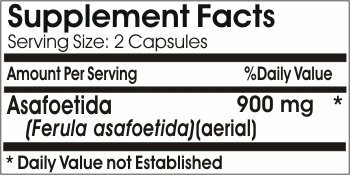 DIRECTIONS: For adults, take two (2) capsules daily, preferably with meals. If you have any questions about this product by Premium, contact us by completing and submitting the form below. If you are looking for a specif part number, please include it with your message.